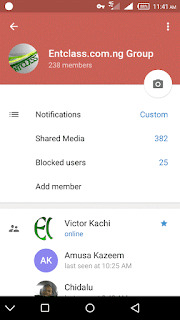 Early May, this year 2016, i closed our Whatsapp group chat, because the two Whatsapp group i created for Entclass Blog was filled up and i can't continue to create new groups on Whatsapp. That's the most reason i migrated to Telegram, because it can take upto 5,000 members (which i have upgraded to). Now, Entclass Blog Telegram group chat is open for new members. Joining the group has been made easy. I don't need to approve you before you join the group chat. I will be teaching you how to join our Telegram group chat without Admin permissions. Follow me along. => First of all, download Telegram app from your respective App stores, either Playstore, iTunes, Blackberry world etc. => Create an account if you are a new user. => After setting up your account, kindly Click Here to join our Group chat automatically (Direct Entry) lol. NOTE: We don't tolerate irrelevant links sharing in the group chat. We are there to answer minor questions and help one another on any topic related to Technology and Free browsing cheats. Any questions laid in the group chat regarding a post on this blog, should be posted here on this blog via the comment box, and i will reply you immediately. Any person found violating the rules of the group will be automatically be removed without warning. We hope to see ourselves grow together, share knowledge together and meet gurus in their own respective fields. The group is hot and there are members already waiting for you there. You can also share the invitation link on social media, so your friends can join automatically too and enjoy the benefits of the group. Copy the link from the box below. Alright sir. You are added.